First published in Around the O on November 16th, 2018. A little bird led Swedish-born Martin Stervander to the University of Oregon, but his journey wasn’t a direct flight. 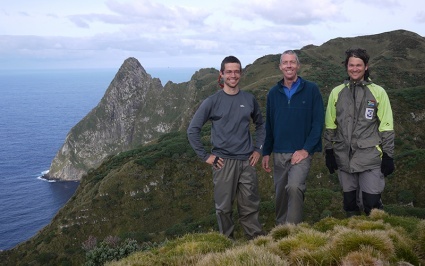 As a doctoral student at Lund University he studied the genetics of a bird species that only lives on Inaccessible Island, a tiny patch of volcano-produced land in the Atlantic Ocean between South America and Africa. While pursuing that research, he met UO biologist Bill Cresko and learned about a genomic analysis technology invented at the UO. RAD stands for restriction-site associated DNA. The methodology, which emerged from a collaboration between biology professor Eric Johnson’s lab and the Cresko lab, creates a detailed library of genetic code. It led to a new generation of sequencing technologies. The first major application helped identify genetic differences in stickleback, an ocean fish that has repeatedly adapted to freshwater. When first unveiled in 2007, the technology led to the UO spinoff company Floragenex. Last month, Stervander’s research took flight. He was lead author on a paper in Molecular Phylogenetics and Evolution that identified the origin of Inaccessible Island’s bird, a rail. His team called for a reclassification of the flightless bird’s place in the avian tree of life. The bird, according to its genetics, descends from a South American ancestor that also gave rise to the continental dot-winged crake. These sister species are related to black rails in the Americas and, probably, the Galapagos crake. Stervander recommends that the rail should be in the genus Laterallus to match its relatives. The island’s bird was labeled Atlantisia rogersi in 1923, when British surgeon Percy Lowe, then head of the ornithology collections at the British Museum, first described it. He created the new genus, Atlantisia, in honor of mythical Atlantis. He also suggested that the rail may have walked to the island along a since sunken land bridge from either Africa or South America. Plate tectonics later ruled out a land bridge, Stervander said. Cresko met Stervander after traveling to Lund in 2012 to speak at a workshop arranged by the university’s research school in genomic ecology to discuss the RAD technology that had emerged from his and Johnson’s UO labs. They jointly submitted postdoctoral proposals. The Swedish Research Council agreed to fund a three-year fellowship for Stervander at the UO. Stervander’s interest in birds began as a child. Before entering Lund University, he worked in various research projects and as a bander in several bird observatories. For two years, he headed Sweden’s Ottenby Bird Observatory. In addition to traveling to Inaccessible Island, he spent time on islands in the Gulf of Guinea off West Africa. He has a keen interest, he said, in finches that have colonized and evolved to survive on isolated islands. In Cresko’s lab, Stervander is working with a family of fish that includes pipefish, seahorses and seadragons. All use their long snouts to suction their food. What he learns from the fish, he said, may help him understand how finches living in isolated locations have reshaped their bills to allow them to eat.